Change is underway in Braddock as groups working with and within the community bring renewed energy to a town that many wrote off. Artists, social entrepreneurs, community organizers, urban homesteaders and others with a pioneering spirit are inspired by the town’s potential for grassroots urban renewal and are using the inherent energy in Braddock to fuel their creativity. It is with this spirit that OBSCURAE views the maligned town – turning a photographic eye towards the borough’s oft-overlooked beauty amidst the former grandeur and “urban blight” that Braddock has come to represent for many. Curated by Braddock residents Jenny Fremlin and Jodi Morrison, with special guest curator John Ryan Brubaker, OBSCURAE pays homage to Braddock’s unique post industrial urban beauty. From the borough’s Victorian and industrial-era construction to particulars of its natural surroundings, each photograph captures a unique perspective of the town. Works are mounted and framed with found-materials from the community. In creating OBSCURAE , curators Fremlin and Morrison hope to encourage others to look deeper and appreciate the small wonders that drew them to Braddock. Join us for a two-day photography exhibition/fundraiser on Friday, December 5 and Saturday, December 6, 2008. Benefiting Braddock Redux’s continuing revitalization efforts of this historic steel mill town. 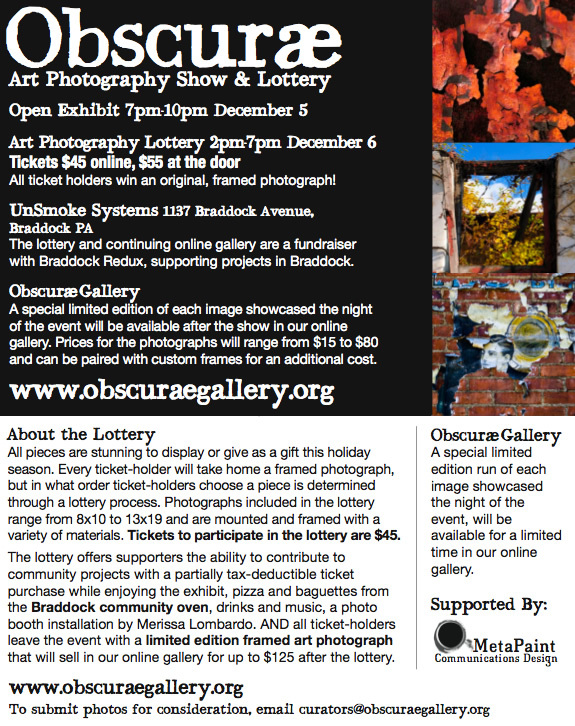 OBSCURAE features more than 100 donated and framed photographs of Braddock from over 25 photographers that ticket holders will win and take home at the OBSCURAE art photography lottery. Public viewing of the work, open to all and free of charge, begins Friday from 7 – 11pm and continues Saturday at 2pm; the art lottery commences at 4pm Saturday. Those attending OBSCURAE, held at UnSmoke Systems Gallery at 1137 Braddock Avenue, are invited to take part in the gallery’s interactive photo booth designed by installation artist Merissa Lombardo and taste fresh-baked pizza by Josh Tonies made in Braddock’s very own outdoor wood-fire community oven located next to UnSmoke Systems. There is no charge to attend OBSCURAE and view the exhibition; visitors wishing to take home a work of art can purchase lottery tickets for $45 through the website, www.obscuraegallery.org, or for $55 at the door. The lottery offers supporters the opportunity to contribute to Braddock art and community projects. At the same time, supporters will be able to enjoy the exhibit, local food and drinks, the photo booth installation, AND leave with a limited edition framed art photograph that will sell in OBSCURAE’s online gallery, many for over $100. Photographs included in the lottery range from 8×10 to 13×19 and are mounted and framed using a variety of reclaimed materials. All pieces are stunning to display or give as a gift this holiday season. what do you know..! I just recieved $29 from cashlot.co.uk! Thanks for this great write up. I absolutely enjoyed every little part of it. I have you bookmarked and will be visting.